BYU in review: Now that they’re bowl-eligible, Cougars can play like they’ve got nothing to lose against rival Utah on Saturday. But will they? 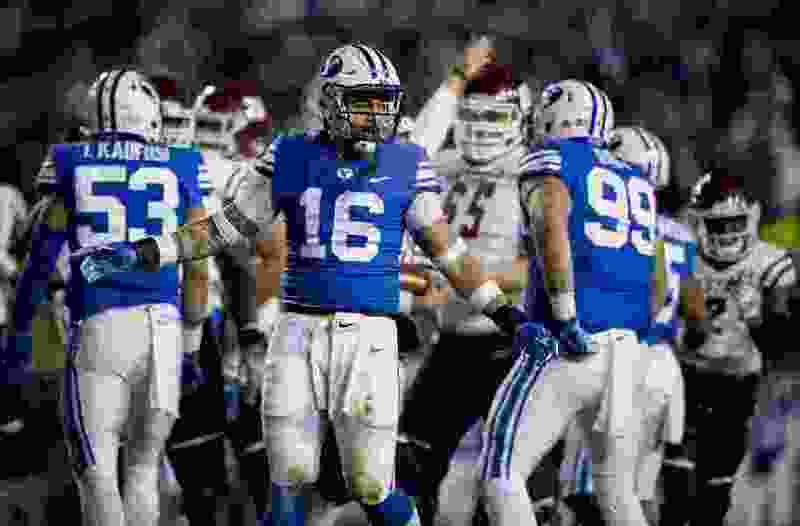 Provo • After a pair of heartbreaking losses to Northern Illinois and Boise State put their postseason aspirations in jeopardy, the BYU Cougars took care of business the past two weekends, knocking off UMass and New Mexico State to become bowl-eligible. Getting to six wins also took some considerable pressure off the Cougars (6-5) as they head into rivalry week and Saturday’s showdown (8 p.m., FS1) at Utah. As running back Lopini Katoa said after becoming the first BYU freshman to run for four touchdowns in a game in the 45-10 win over lowly NMSU, the Cougars no longer have that burden on their backs. Really, can the Cougars take down the Pac-12 South Division champion Utes, after having lost to their rivals in the last seven matchups? Head coach Kalani Sitake, the former Utah defensive coordinator, said the Cougars can’t be afraid or intimidated, and won’t be. Anybody who thinks the Utes might rest their starters or fail to properly prepare after clinching the Pac-12 South late Saturday night when Oregon defeated Arizona State doesn’t know the history of the rivalry. Sitake congratulated Utah coach Kyle Whittingham and the Utes on their achievement, but said his longtime boss won’t give an inch come Saturday. Utah won the 2016 game at Rice-Eccles 20-19 when its defense stopped BYU quarterback Taysom Hill’s two-point conversion try in the final seconds. The Cougars don’t appear to have the talent to keep it that close this year, especially on offense. And they can’t afford another slow start like they’ve had for three straight games and five of their last six. There will be plenty of that at Rice-Eccles Saturday. BYU can count on that. • Season-ending injuries sustained by key defensive starters are starting to catch up to the Cougars. Senior defensive end Corbin Kaufusi was the latest to be sidelined for the season with a foot injury, and BYU’s pass rush definitely suffered. They sacked Josh Adkins five times, but couldn’t get to the NMSU quarterback at all in the first quarter when they were rushing three or sometimes four down linemen. • The Cougars will have to play mistake-free, and get some breaks, to beat Utah. On paper, the Utes are simply far more talented than BYU, even with a backup quarterback (Jason Shelley) and running back (Armand Shyne). BYU’s offensive and defensive lines were pushed around at times in the first half by NMSU’s lines before settling in and dominating the last half of the second quarter and entire second half. Utah’s obviously better in the trenches than those Aggies. • Zach Wilson showed some poise and moxie in bouncing back after a poor start. The freshman was 1 of 8 for 8 yards passing before starting to click early in the second quarter, displaying the kind of resiliency that will be needed when things go wrong on the hill. And they almost certainly will. • Linebacker Isaiah Kaufusi’s second-quarter interception. The redshirt sophomore picked off a pass to end a drive after the NMSU reached the BYU 31 and was threatening to take the lead. The Cougars subsequently marched 77 yards for a TD and the rout was on. • Lopini Katoa. With senior starter Squally Canada out again with an undisclosed injury, the freshman rushed for a career-high 155 yards on 19 carries, with a long of 50 yards. Runner-up: Senior linebacker Sione Takitaki didn’t put up his typical tackling numbers, partly because he was spelled in the second half when the outcome was no longer in doubt. But he did register six takedowns, including a sack and another tackle for loss. BYU at Utah, 8 p.m.